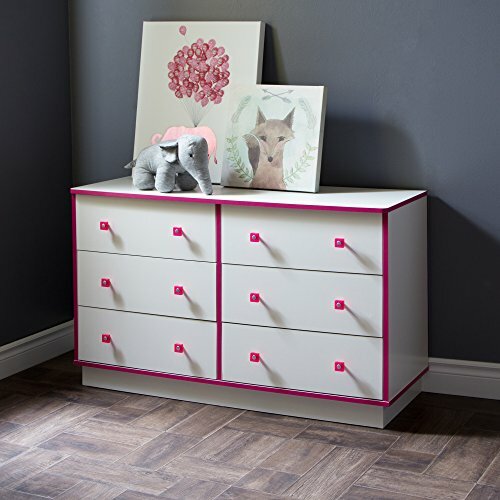 This dresser with bright pink edgebanding is just what you need to add a feminine touch to your little princess’s room. It’s perfect for your storage needs and your daughter’s room will be a true reflection of her personality! Clear pink square plastic handles with metal centers. Platform base for a great contemporary look. Metal drawer slides. Drawer dimensions #1: 23.5'' (L) x 13.625'' (D) x 5.125'' (H). Meets or exceeds all North American safety standards. Accessories not included. Requires complete assembly by 2 adults (tools not included). 51.125'' (W) x 18.75'' (D) x 27.25'' (H). Box dimensions: 57.205'' (L) x 19.567'' (W) x 6.417'' (H), 116 lb. Ships in a heavy box, make sure to have a friend with you. Packaging tested and certified to reduce the risk of damage during shipment. Made in North America with non-toxic laminated particleboard. 5-year quality guarantee. Any questions? Contact South Shore, the manufacturer, available 7/7 by phone, email or chat.